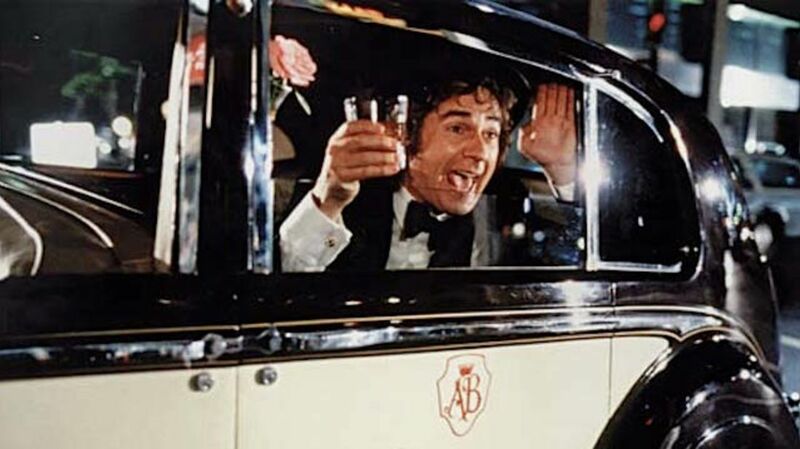 Dudley Moore played the titular role in Arthur (1981), Steve Gordon's classic comedy, with Liza Minnelli portraying waitress Linda Marolla and Sir John Gielgud in an Oscar-winning performance as Arthur's dryly sarcastic servant, Hobson. In the film, Arthur Bach—a wealthy, witty alcoholic—falls for Linda just as he is about to get married to a wealthy heiress, who he is only marrying to appease his grandmother and to keep his inheritance. To celebrate the film's 35th anniversary, here are 10 rich facts about Arthur. 1. JAMES CAAN, AL PACINO, JOHN TRAVOLTA, AND JOHN BELUSHI TURNED DOWN THE LEAD. Neither James Caan nor Al Pacino was interested in the role. John Travolta said no, too. John Belushi did not want to be typecast. After 18 months, Paramount dropped the project. After Orion Pictures came aboard, Dudley Moore won the lead. 2. DEBRA WINGER TURNED DOWN THE ROLE OF LINDA. Like her Urban Cowboy (1980) co-star, Debra Winger said no to the film. 3. DUDLEY MOORE CONVINCED THE DIRECTOR TO CONSIDER SIR JOHN GIELGUD. For the role of Arthur's valet, Hobson, writer/director Steve Gordon considered Sir Alec Guinness and David Niven. Then Gordon heard Sir John Gielgud's name from his star. "I told Steve Gordon [that Gielgud] was wonderful at comedy, having seen him in English plays," Moore explained. "It was terrific to play off him because he has worked so much in the theater." Despite not finding any film of Gielgud being funny, Gordon and legendary producer Charles H. Joffe (Annie Hall, Manhattan) made the actor an offer. He turned it down. "I thought it was rather smutty and a vulgar little film, so I refused it," Gielgud said. "But each time they asked me they doubled my salary, so naturally I became reconciled to do it." 4. GIELGUD DIDN'T KNOW IF HE WAS DOING A GOOD JOB. Joffe later said the actor "never really understood the jokes he was giving." According to Minnelli, Gielgud kept turning to her and Moore asking if what he just said was funny. After the film came out, he wrote to journalist George Pitcher, explaining that he was "very bucked" at the success of Arthur. "I thought Liza so very good, and underestimated by the critics," Gielgud added. "Dudley screams too much at first, but gets better all through and is very charming and co-operative in the scenes with me. We also got on so wonderfully well together, despite that appalling heat." 5. GORDON AND MOORE ARGUED OVER ARTHUR'S ACCENT. "I explained to the director I couldn't possibly do it as an American since I spent half the time trying to get my vowels right," Moore reasoned. The two continued the discussion of whether Moore should use an American accent even after filming had started, but Moore won out. 6. GETTING THE ICONIC ARTHUR CACKLE WASN'T EASY. "I just loved that man, Arthur," Moore said. "Those scenes in the beginning of me laughing were something else to do. Getting the laughter out of myself was a problem." After shooting the scene where Arthur gets beaten up by his would-be father-in-law, he was still wearing his tattered costume and bloody makeup when he turned to his then-girlfriend Susan Anton (who was nearly 8.5 inches taller than him) in a Waldorf-Astoria elevator and said, "Susan, I told you I'd be home, why wouldn't you believe me?" The other elevator passengers were aghast. 7. THERE WAS A LOT OF FUN AND CHAOS ON SET. Moore kept cracking up the cast and crew, so much so that 27 takes were needed to get one scene filmed at one point. Also, shooting in New York City in the summer of 1980 drew thousands of onlookers curious about Liza Minnelli's new project. One of the older onlookers confused Minnelli for her mother, Judy Garland. In Minnelli's dressing room, Moore—an accomplished pianist—would play her piano. Sometimes Minnelli would sing along. Other times, Jill Eikenberry (who portrayed Arthur's fiancée, Susan Johnson) played. 8. FOUR DIFFERENT ENDINGS WERE SHOT. Steve Gordon still hadn't figured out which ending to use during the editing stage. A rough cut, which Moore objected to, gave more of a focus on Arthur and Hobson's relationship than Arthur and Linda's. 9. "ARTHUR'S THEME (BEST THAT YOU CAN DO)" WAS WRITTEN IN THE MIDDLE OF THE NIGHT. The hit song—which won the Oscar for Best Original Song in 1982—was composed by Christopher Cross, Burt Bacharach, Carole Bayer Sager, and Peter Allen (Minnelli's ex-husband). The standout lyric, "When you get caught between the moon and New York City" came from an unpublished song written years earlier by Allen. Cross had originally been asked by the studio to score the film, but Gordon opted for the more experienced Bacharach instead. Cross was still invited to work on the theme to the movie. Cross went over to Bacharach's Beverly Hills abode at midnight, and the two finished the tune by five in the morning. "I think Burt, out of all four of us that wrote it, was certainly the most responsible for the track," Cross claimed. "Peter and Carole came up with the words, Burt and I put the music together." 10. THE STUDIO COULDN'T FIGURE OUT HOW TO PROMOTE THE MOVIE. Joffe said that he and Gordon "had no feel where the audience was. If you had called me four weeks before Arthur opened and asked me who was going to go see the film, I couldn't have answered." They ended up abandoning six different ad campaigns before settling on one with a tipsy Moore, martini in hand, behind the wheel of a Rolls-Royce. Positive word of mouth was credited for the movie doing better in its third week than in its second and ultimately making $95.4 million domestically, making it the highest grossing comedy of 1981.